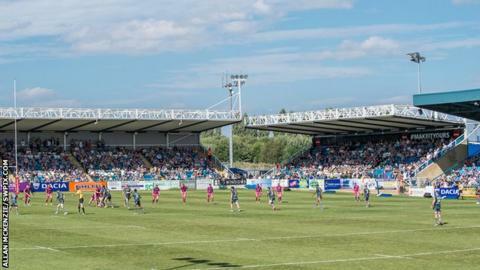 Featherstone Rovers have made a formal offer to Super League club Wakefield Trinity to ground-share at Post Office Road for at least 2018. Trinity chairman Michael Carter said in Sunday's Salford programme notes that 2017 is their final year at Belle Vue. The venue would not meet minimum ground standards for the top flight. "We believe Wakefield playing at Featherstone would be the best-possible fit for supporters," Rovers general manager Davide Longo said. "[Particularly] given the fact our stadium is situated less than five miles away." Longo said informal talks had been held between the clubs which, if successful, would see Trinity play home fixtures in the town in addition to their existing training agreement. "I think it goes without saying that our stadium meets minimum standards set by the Rugby Football League," he added. "And we are constantly making improvements to ensure it continues to develop as a high-quality facility - fit for top-flight and even international rugby league. "I, for one, sympathise a great deal with the Wakefield board of directors, staff, players and supporters, given the predicament they find themselves in. " It is not the first time Wakefield have considered moving on - with Dewsbury tipped as a destination - before an agreement to redevelop the site was completed. However, there has been no further development six months on and Trinity, who moved into the ground in 1895, have issued notice of their intentions to leave. Super League's minimum requirements for 2016 stipulate that grounds must have a minimum capacity of 5,000, with 2,000 of that seated. Belle Vue's capacity is just over 7,000 while Post Office Road has an 8,000 capacity. There are other requirements including media facilities, disabled access and provision as well as closed-circuit television and parking.